Muscular Moving Men got started in Arizonia as a local moving service and has expanded into the Metro Detroit Area since. The team at Muscular Moving Men can schedule your move across town for a simple cross town relocation. Clients may also have to the need to relocate to or from destinations as far off as across the country in California or Texas. 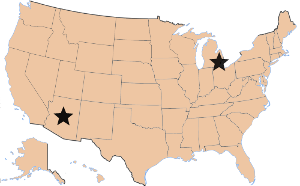 Whether you are moving to these destinations or coming to Detroit, Muscular Moving Men has got you covered! Muscular Moving Men can service clients that are moving out of the Metro Detroit Area to other states or even pick up clients out of state and bring back to the city. Utilizing a skilled staff of local and long distance drivers, our team can schedule your move and be competitive with other movers in the market. The in office staff will provide a clear price based on the list of item being moved and the locations. When it comes to moving businesses, you don’t want to leave the move to a company that is only focused on residential moves. Muscular Moving Men is 1 of 3 Metro Detroit Area companies that has been certified by the International Office Moving Institute (IOMI). The estimation and move process is entirely different when it comes to office moves. Trust the pros at Muscular Moving Men to provide you an accurate estimate and get the job done right! Relocating internationally? No problem, the team at Muscular Moving Men works with qualified freight forwarding companies in partnership to get the job done right. From the inventory and packing process to the delivery and debris haul away at the destination, you can rest assured the price will be competitive and the service will be second to none.